The Wright Flyer III taught the Wright brothers—and the world— how to fly in a useful fashion. 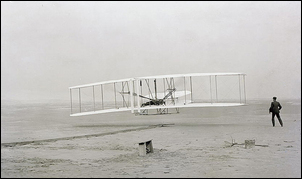 While the Wrights had first taken to the air a year-and-a-half earlier, their first flights at Kitty Hawk, North Carolina, proved only that powered flight was indeed possible. Making flight practical and useful was something else. That effort required every bit as much genius, dedication, and hard work as did those first, brief leaps into the air at Kitty Hawk. Wright Flyer III, the Wrights’ third airplane, looks much like their first Flyer, the one that showed the world that it could fly, but a number of significant differences make this the machine that made the world want one too. Humans dreamed of flight among the birds since ancient times. The mythical story of Daedalus and Icarus escaping the maze on wings of feathers and beeswax is perhaps the best known of many early legends involving flight. Leonardo da Vinci’s concepts for an ornithopter and protohelicopter show that the dream remained alive during the Renaissance. These ideas for human-powered flight were impractical, but the interest never waned. During the first half of the 19th century, Englishman George Cayley began serious work that he hoped would result in an airplane. He succeeded in building a glider large enough to carry his coachman on a flight in 1853—after which the coachman promptly resigned. But in the nineteenth century, other experimenters, notably John J. Montgomery, Octave Chanute, and Otto Lilienthal, built and flew a variety of gliders. Hiram Maxim and Samuel P. Langley were the most notable of those who attempted to marry a glider to a steam engine, the most reliable power plant of the day. While both performed tests that suggested a successful, manned flight was imminent, neither met with success. The spectacular failures of Langley’s Great Aerodrome on October 7 and December 8, 1903, were recorded in widely circulated photographs. It remained for two unassuming brothers, Wilbur (1867- 1912) and Orville (1871-1948) Wright, bicycle mechanics from Dayton, Ohio, to methodically work through the problems associated with flight—lift, power, structural strength, and control—and produce a machine that could accomplish the task. For four years the brothers systematically tackled these problems and overcame them one by one. Along the way they provided a model for aeronautical research and generated information that would help form the foundation for what we now call aeronautical engineering. There is no more famous event in the annals of aviation history than the first powered flight by Orville Wright on December 17, 1903. This 12-second flight covering 120 feet marked the first time a human had successfully piloted a self-propelled machine that rose into the air on its own power and landed on ground as high as that from which it had taken off. Fortunately, the Wrights had enlisted the aid of some nearby lifesavers at Kitty Hawk, and one of them, John Daniels, snapped a camera shutter as the Wright Flyer rose into the air, taking one of the most famous photographs of all time. Orville Wright made one more flight that day, and his brother Wilbur made two, with his last one covering 852 feet in 59 seconds. Shortly thereafter, the brothers’ jubilation at their success was dampened when a gust of wind picked up the fragile plane and flipped it over, causing major damage and bringing the first series of flight tests to an end. Between them, the Wrights had amassed a total of 98 seconds in the air. The significance of these first flights cannot, and should not, be minimized. They were, after all, the achievement of the lofty goal that many great minds had sought in vain for centuries. The Wrights, however, were practical men, and even while announcing their success and taking preliminary steps to protect their invention, they realized that their quest was far from over. The Wright Flyer had indeed flown, but it had flown basically in a straight line and only a few feet above the ground. This was far short of the capabilities needed in a practical, useful airplane. To be truly practical, an airplane would have to be able to climb to an altitude that would clear trees and buildings, and it would need to be fully manoeuvrable so that a pilot could turn it and fly in any direction at will. In addition, a practical airplane would have to be reasonably safe and easy to control. Returning to Dayton in time for Christmas, the Wrights realized that they were at a crossroads. The bicycle shop was their livelihood; they had been pursuing their dream of flight as a sideline. Now that they had achieved what they thought would be their goal, they recognized how much development work still remained to be done. If they were going to undertake that—and to realize any financial reward for their work they would have to—the brothers had to make a full-time commitment to aviation. They decided to turn the shop operations over to Charles Taylor (1869-1956), the machinist who had built the Wright Flyer’s 12-horsepower gasoline engine, and devote all their time to perfecting their airplane. In addition to managing the shop, Taylor would continue to contribute his talents to flying machine development as needed. The Wrights also realized that they needed a location close to Dayton where they could fly on a regular basis to test new ideas. An 84- acre field called Huffman Prairie, about eight miles east of town and adjacent to a Dayton, Springfield & Urbana interurban stop called Simms Station, filled the bill. It was easily accessible, yet somewhat isolated from prying eyes, and it was large enough to suit their needs. Its owner, Torrence Huffman, was sceptical of the Wrights’ endeavours, but he granted them permission to use his field. By April 1904 they had cleared the field, erected a wooden shed, and begun assembling their next flying machine, now known as 1904 Wright Flyer II. The second Wright Flyer was almost a duplicate of the 1903 Wright Flyer. Accordingly, it suffered from all the same problems, especially those of power and control. 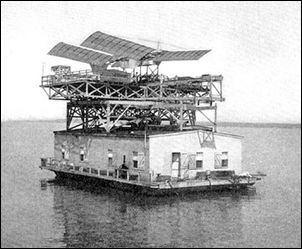 While the first Wright Flyer had flown, it was very difficult to control. The first four flights had been rather wobbly ventures, with the craft tending to pitch up and down through the air. 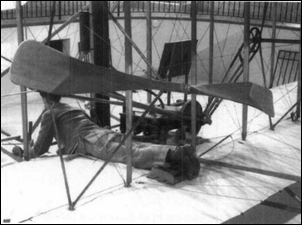 In fact, Wilbur’s first attempt at powered flight on December 14, 1903, ended almost before it began when the nose pitched up and caused the plane to stall on takeoff. The brothers had made no attempt to turn in the air. It was all they could do to keep the craft aloft and make reasonably controlled landings. Nevertheless, the original Wright Flyer’s design was the only logical starting point. 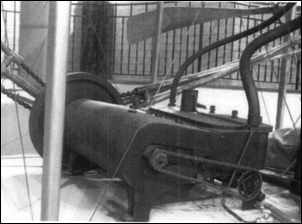 To replace the damaged 1903 engine, the Wrights designed, and Taylor built, a new engine that produced about four more horsepower, and the brothers relocated the elevator’s pivot point to reduce pitch sensitivity. The gas tank and radiator were moved toward the rear. They also flattened the wings’ camber from 1/20 of the chord to 1/25 (a mistake that reduced lift) and strengthened the rudder structure. Wright Flyer II was ready to fly on May 23, 1904, but it failed to leave the ground in its first test—in front of about 40 unimpressed onlookers. Three days later, the frail craft managed to fly a brief, 25-foot hop. The brothers tried 40 more flights through August, but the longest one covered only slightly more than three-fourths the distance of the longest flight at Kitty Hawk. The problem was a lack of wind. They had launched into a strong headwind at Kitty Hawk, but the air over Huffman Prairie was calm, sometimes gusty and less dense. The plane needed an air speed (the relative speed through the air) of at least 23 miles per hour to lift off. That meant a ground speed of less than five miles per hour into the Kitty Hawk wind, but ground speed and airspeed were essentially the same in Dayton. 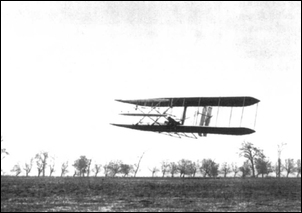 The Wright Flyer simply could not reach the necessary speed by itself before reaching the end of the launching rail. The answer was a catapult to accelerate the plane down the rail. The brothers built a 20-foot tower at one end of the rail. A 1,600-pound weight was suspended from its top by a rope that ran through pulleys to the far end of the rail and back to the small launching carriage. When a hold-down rope was released, the falling weight provided the extra boost necessary to achieve more than the minimum lift-off speed. The catapult’s additional force was great enough that the rail could be shortened to only 60 feet in length. The first test of the new launch system on September 7 was a rousing success. Once the Wright Flyer II was safely in the air, it performed reasonably well, and flight distances and complexities increased. By September 15 the Wrights were making flights up to a half-mile in length, and they could make complete turns in the air. Orville flew a complete loop around the field on September 20, taking about a minute and a half to fly over 4,000 feet. While they achieved progressively longer flights, accidents were common. Fortunately, most were minor, but the brothers suffered a variety of bumps and bruises and made countless repairs to the machine. As the brothers’ piloting experience grew, they realized that Wright Flyer II was next to uncontrollable. Soft landings were rare. The biggest problems involved pitch. The craft would often begin to oscillate vertically during straight and level flight for no apparent reason, frequently resulting in a rough landing. Moving the centre of mass forward by attaching a weight under the elevator helped some, but clearly more needed to be done to get pitching performance under control. Wing warping controlled roll very well, but the plane would tend to lose altitude when banked into a turn. This area, too, needed much more development work. As they packed up on December 9, after their last flight of 1904, the Wrights were already thinking about their next airplane. In the new plane, the brothers returned to their 1903 wing camber of 1/20 of the wing chord. Because of its now-polished cylinder walls, they found that the engine could produce more than 18 horsepower, but catapult launches still would be necessary. 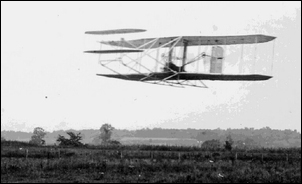 With its similarity to Wright Flyer II, the Wrights could not have been surprised when Wright Flyer III exhibited essentially the same flying characteristics as its predecessor. Flight testing began on June 23, but no flight exceeded 20 seconds, and almost every landing was hard enough to damage the plane. The worst accident occurred on July 14, when Orville was unable to control pitching oscillations. Twelve seconds after launch, he nose-dived into the ground at about 30 miles per hour, smashing the elevators. The plane bounced three times and overturned, ejecting Orville. Dazed and bruised, he was lucky not to have suffered serious injury. When the brothers rebuilt Wright Flyer III this time, they made some major changes. Most of their attention went into improving the elevator and getting pitch under the pilot’s control. They increased the elevator surface area by over 50 percent and, more importantly, moved the whole elevator assembly almost 51/2 feet farther in front of the wing. This moved the centre of mass farther forward and lengthened the moment arm through which the elevator acted. The relocated centre of mass made the craft less likely to pitch upward, and the increased length made the plane less sensitive to minor elevator movements, thus reducing the likelihood that a pilot would over-correct. After a brief first flight of the day, they reset the plane on the launching cradle, hoisted the catapult weight to the top of the tower, and cranked the engine. Wilbur took the pilot’s position and released the clip holding the craft back. As the weight fell, the plane accelerated down the rail and took to the air. The spectators saw it make a graceful turn and begin to circle the field, much the same way many flights started. But instead of circling the field four or five times, Wilbur kept going. Once again, Wilbur flew until his fuel was exhausted, only this time he had enough to remain aloft for 39 minutes, 24 seconds, and cover slightly over 24 miles, a distance longer than all of the previous 109 flights put together. Once again, Wilbur and Orville Wright had succeeded in reaching their goal. Wright Flyer III was the practical flying machine they sought. Unlike anything else in the world, it could take off, climb into the air, fly for extended periods in any direction completely under the pilot’s control, and land in a safe, controlled manner. And it had shown that it could do all of this over and over again. Six years of work, frustration, successes, failures, and above all, dedication had led to the world’s first practical airplane. While some fundamental changes in airplane design would come in the future, the primary one being the relocation of the elevator to the tail of most planes, the basic concepts proven by the Wrights with Wright Flyer III remained the foundation for these designs. 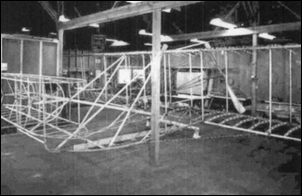 Wright Flyer III utilized the same basic structural design as its predecessors. The frame was primarily spruce, covered with a muslin skin. Wire cables served as diagonal members, forming a strong, yet flexible truss between the two wings. Other cables attached to the control handles and hip cradle transmitted the pilot’s movements to warp the wings and pivot the elevators and rudders. As rebuilt, Wright Flyer III had wings with a 40.5-foot span; a 6.5-foot chord; 1/20 camber; and a total area of 503 square feet. The wings were 6 feet apart. The double canard elevator area totalled 83 square feet, while the dual rudders were 34.8 square feet in area. The modified craft’s overall length measured 28 feet, and it weighed 710 pounds. The engine was mounted to the pilot’s right, and a pair of roller chains drove the twin propellers. To counteract torque effects from the propellers, the Wrights designed them to turn in opposite directions, just as they had done from the first Wright Flyer on. To accomplish this, the longer, left-hand chain went through a pair of tubes that flipped the chain between the engine and propeller. As with the 1903 engine, the 1904-05 engine was designed by the Wrights and built by Charlie Taylor. It had several improvements over the earlier engine, including improved cooling, pressure lubrication, a fuel pump to replace the gravity feed, and compression relief for easier starting. The ingenious compression-relief device automatically moved the camshaft slightly to prevent the valves from fully closing when the cam’s driving force came from the propellers, as it did when starting the engine. Once the engine started and the crankshaft began driving the cam, it moved back to its normal position. This feature also allowed the propellers to windmill more freely in the air stream whenever the craft was gliding. The Wrights did not consider this engine to be a particularly significant part of their achievement, but instead just an ancillary item they had to have. The propellers, on the other hand, were aeronautical works of art in which the brothers justly took pride. Unlike their predecessors, the Wrights recognized that a propeller was a not a fan to move air, but a rotating wing that generated a horizontal “lifting” force called thrust. Just as they had done for their wing experiments, they used a wind tunnel to determine the shape for their propellers. The results, hand carved out of laminated spruce, were 8.5-foot-diameter propellers with an astonishingly high efficiency of 66 percent, well beyond anything else in 1903. For Wright Flyer III, they carved improved propellers with bent ends they called “little jokers.” These ends looked peculiar at rest, but they flexed to a more-efficient configuration in operation. Like their earlier propellers, the brothers covered the ends in canvas to resist splitting. They utilized this design on all of their succeeding planes. Following the 1905 flying season, the brothers disassembled Wright Flyer III and carefully packed it away. In the spring of 1908, however, they held two contracts for airplanes, one with the U.S. Army Signal Corps, and another with La Compagnie Generale de Navigation Aérienne, a French consortium. Both contracts had performance specifications that the brothers felt they needed to test in flight, but out of the view of spectators and possible rivals. The lonely dunes of Kitty Hawk were ideal, or so they thought, so they refurbished and modified Wright Flyer III and in April took it to the site of their first flights. The basic airframe was unchanged, but they installed one of their new 4-cylinder, vertical engines that developed about 35 horsepower, and the pilot now sat upright in one of two seats with revised controls at his side. But in spite of Kitty Hawk’s remoteness, reporters got wind of their presence and turned up to record—and exaggerate— the events, much as they had done following the 1903 flights. 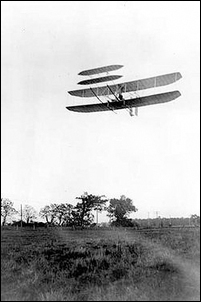 On May 6 Orville took to the air for his first flight since 1905. About a week later, the brothers were surprised when Charlie Furnas, a mechanic from Dayton, appeared at the camp. Furnas wanted to fly, and they needed to test with two people on board, so Wilbur took him on a short flight on May 14, marking the first time a Wright airplane carried two people. A short time later, Furnas joined Orville on a longer flight. That afternoon, Wilbur set off on an extended solo flight, but he mishandled the revised elevator controls about a mile and a quarter after take-off and nose-dived into a sand dune at about 40 miles per hour. He suffered only a few cuts and bruises, but the airplane was shattered. Subsequently, it was rebuilt for historic display. *The Wright Flyer III is an American Society of Mechanical Engineers (ASME) International Historic Engineering Landmark. The text of this story appears by agreement of the ASME. Go to http://www.asme.org/Communities/History/Landmarks/Wright_Flyer_III_1905.cfm for more on this Landmark.